The Cargo Pocket Intelligence, Surveillance and Reconnaissance program, known also as CP-ISR, is a new nano-drone concept dreamed up by the folks at the Army's Natick Soldier Research Center. Where as most unmanned aircraft look to provide info as to what is going on over the next hill, or far over horizon, CP-ISR is all about looking around the next doorway or hedge. 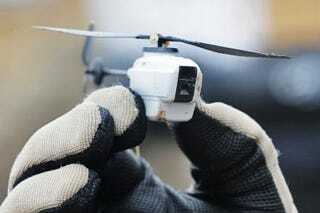 You can read all about what the future of micro combat drones will look like by clicking here. The palm sized Prox Dynamics' PD-100 Black Hornet only weighs in at 16 grams. With a flight time of nearly a half an hour, it can venture out both vertically and horizontally, into villages and buildings, to provide real time intelligence via streaming video from any of its three cameras. Because of its quiet electronic motors and small size, the little spy drone is almost completely undetectable. The whole idea is to bring the unmanned surveillance concept down to the individual squad, and eventually the individual soldier level, and to do so in an affordable and expendible package. The Black Hornet is still in development, and a hardened, more powerful military grade data-link is on the way, along with low light video capabilities and improved controlability for operating in indoor, and other dense environments. Eventually, these little humming bird sized craft will be able to follow special forces teams into high-threat indoor environments, or scout behind barriers and into dark windows for sniper teams. Who knows, eventually they may even become deadly weapons themselves. Other similar systems are being developed by different military R&D houses and defense contractors, but the Black Hornet seems to be one of the most developed and well regarded at this time. Regardless of if it makes it into widespread production and deployment, it is safe to say that the age of micro drone technology has arrived, and life will never be the same again because of it.